Main heroes are Alan Parrish, Sarah Whittle, Judy Shepherd, Carl Bentley, Sam Parrish and Nora Shepherd who get involved with the mysterious game at different points in time. Robin Williams played Alan and did a fantastic job in this role. The movie allowed people to fall in love with board games once again and having and actual Jumanji game became one of the things children wished for. 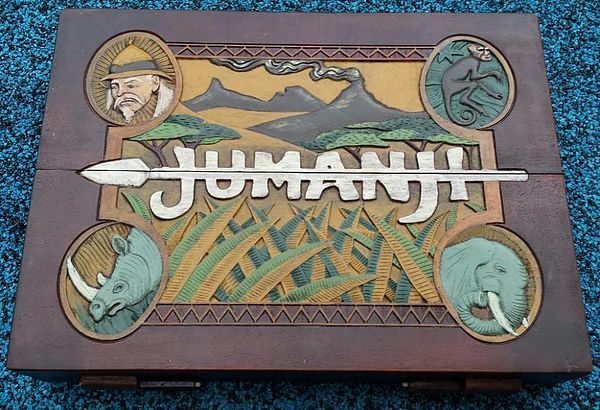 It has been quite some time since Jumanji came out but the movie is still amazing and the desire to have a themed, actual board game has not gone away, not to the fans. There are people who collect memorabilia and other items from movies they like. Jumanji is no exceptions. And now there is a chance of having this game since it has been created and designed to make dreams come true. There are several aspects people are looking for where board game making is concerned. This re-creation of the famous board game from about 21 years ago is made from the highest quality wood by a talented artist and wood work artist. He now has fulfilled many dreams with his work. It’s hand-made, therefore it’s sturdy and the artist has paid a lot of attention to the smallest details. Accuracy is something collectors are very interested in. It does not work if a prop is created or re-created and some things are different or have not been included at all. Basing the board on tons of reference pictures, the creator has made the 1. Jumanji Board Game as screen accurate as possible. Additional extras for the 1. Jumanji Board Game , include the 4 tokens. There is an elephant, a rhino, a monkey, and a crocodile. All of these little tokens are sculpted by hand, cast in resin and then painted. Even these little tokens are screen accurate and there is also dice included in the game. All of these things come together in one amazing package and all people have to do – set the game up, sit down and play, allowing the nostalgia for the film to be recreated in full force. In conclusion it should be said that this 1. Jumanji Board Game is not just a token of appreciation for the movie. It will be appreciated by families and collectors alike because of its quality and high attention to detail.